Nice, the variable declaration is inlined. It only means one thing, ternary! And now that exceptions can be thrown inside of ternary statement? 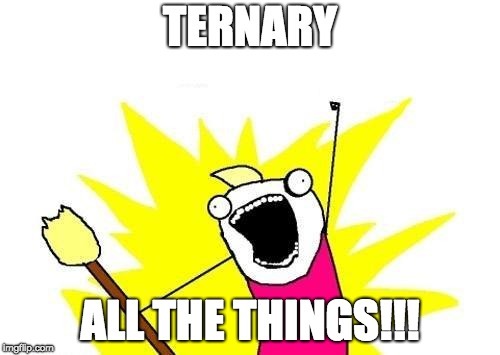 Ternary all the things! : rs[names] is System.DateTime value ? And who uses return statement in the 21st century? Use lambda expression syntax! Using Npgsql version 4.0, NHibernate can persist UTC using DateTime + timestamptz with ease. 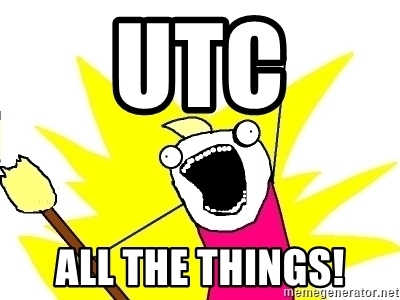 To do that, just pass the TimeZone=UTC to NHibernate's connection string. It has a problem though, it suffers from ghost-update problem. If the consumer of your REST service sends their datetime in UTC, or a datepicker/datetimepicker sends its value in UTC e.g., 2018-05-04T17:37:00.0000000Z, the UPDATE routine would cause an update on the timestamptz column even if that column's existing value (e.g., 2018-05-05T01:37:00+08:00) resolves to "same" value as the UTC. That is due to NHibernate's default reading of timestamptz as DateKind.Local. However, the value 2018-05-04T17:37:00.0000000Z is DateKind.Utc. NHibernate will not attempt to compare the two as the same as they are different kind of Date; consequently, NHibernate will issue an update on the timestamptz column regardless of the sameness of new value to original value. We can make NHibernate make timestamptz return its universal value, a.k.a., UTC. So if it's exactly the same as the new UTC value, NHibernate will not update the timestamptz column. Here's how, on your table mapping, set the timestamptz field's NHibernate Type mapping to your custom type. Do note that you will still use DateTime as the type for the property, you cannot use DateTimeOffset as timestamptz (a.k.a., timestamp with time zone) does not store time zone. timestamptz's time zone is just for presentation purposes only (e.g., in psql/pgAdmin), following dates stores as the same value, the time zone offset is not stored. I think NHibernate+timestamptz causes too much mansplaining in the Postgres community. Just like when you have to explain to someone that there is no Postgre database, it's just Postgres or PostgreSQL, as historically Postgres is a Post-Ingres database. Is there an Ingre database? Nonetheless, Postgres has only few gotchas as compared to MySQL. Well you can use DateTimeOffset for persisting UTC to timestamptz, but NHibernate/Npgsql would throw an exception that it cannot convert DateTime to DateTimeOffset when you get database value from NHibernate/Npgsql, how useful is that? You can write but you cannot read it back. I digress. Here's how you can return DateTime with DateKind.Utc. x == null && y == null ? : x == null || y == null ? No more ghost-update problem, yay!